Examined: 7 May 1976, By: Emmett A. Conway, Sr. When The Olde Forester was inspecting the charcoal blast furnaces of the HRIR for Professor David Crossley, Sheffield University, UK, he used a USGS topographic map dated 1961 which showed the location of many of the old furnaces. However, Union Furnace was not named. There is a Union Hollow Road leading from the northeast side of THE FRENCH GRANT, lands given to the French settlers who were cheated by a promoter. The road was blocked by a chain across the road. The Ironton Country Club has their golf course in the valley north of the furnace which leads to Sperry Fork of Pine Creek. The exact location of Union Furnace was easily spotted on the north bank by the typical bluff. The slope was brushy, but charcoal, ore and blast furnace glassy slag was found on the bank and in the bottom. The road through the golf course is marked “Private”. Pine Grove Furnace is about two miles east of Old Union on Pine Creek and easily found by the company store still in operation. Not only the company store, but one of the old log cabins used by the workers was seen. Across from the red brick store behind an iron fence was the stone foundation of the large furnace master’s home. A church and cemetery are still to be found nearby. Pine Grove Furnace was reached by a tram road which went through a tunnel south of the store. It was used to haul pig iron to the forges at Hanging Rock. From the 1848 famous HISTORICAL COLLECTIONS OF OHIO by the intrepid Henry Howe, we have, perhaps, the first description of UNION FURNACE in Lawrence County. Union Furnace was the first of the charcoal blast furnaces in the Ohio portion of the Hanging Rock Iron Region. Howe traveled the entire state by horse and buggy to prepare his book “Containing a Collection of the most interesting Facts, Traditions, Biographical Sketches, Anecdotes, Etc. Relating to its GENERAL AND LOCAL HISTORY”. The single volume of 595 pages was replicated by Howe in two volumes published on the 1890's. The entire Hanging Rock Iron Region gets its name from the little village of Hanging Rock, located a few miles below the City of Ironton. It gets its name from a high imposing rock cliff leaning over towards the river. Tradition has it that the American Indians used this high point as a lookout for enemies traveling the Ohio River. “Hanging Rock, 17 miles below the county seat, on the Ohio river contains 1 church, 4 stores, a forge, a rolling mill, and a foundery--where excellent bar iron is made--and about 150 inhabitants. It is the great iron emporium of the county and nearly all the iron is shipped there. It is contemplated to build a railroad from this place, of about 15 miles in length, to the iron region, connection it with the various furnaces. The village is named from a noted cliff of sandstone, about 400 feet in height, called the “Hanging Rock”, the upper portion of which projects over, like the cornice of a house. Side note by Emmett Conway. The Ohio Presbyterian Church has a “Hanging Rock Presbytery” which meets regularly in the old Presbyterian Church in Hanging Rock village. "While I was living with Josh Horner at Kelley's Mills on Pine Creek, they began building Union Furnace. 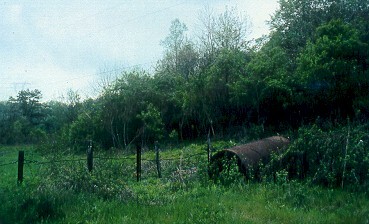 It was the first furnace in Lawrence County and it was of the old style. They began to build when I was 14. It was a short distance from my home and so I went to work for them hauling charcoal. Charcoal was then hauled in 150 bushel bed wagons. The wagons were pulled by oxen as there were no mules in the area at that time. James Rodgers, who ran the furnace, was the first man I ever saw who would count five pecks to the bushel. The furnace made about two tons a day. The output on Sunday was run into pigs, but during the week it was made into hollow- ware, stoves and other cast items. I used to skim the molten metal from the hearth and pour it into the molds. I have done that many a time." "From these general remarks, it will be seen that there is, in the lower Coal measures of the 2nd District, a large development of very fine iron ore. The ores, as a whole, are much richer and purer than the coal measures ores in other parts of the country, and give the District an enviable pre-eminence. The 'Hanging Rock' iron, (for this name is generally given to all the iron made south of the Hocking river,) is everywhere celebrated for its superior quality. The first furnace in the Hanging Rock District was built in 1826, by Messrs. Sparks, Means & Fair. It was called the Union Furnace, and was situated about four miles back from the present Hanging Rock. It is reported that it went into blast in 1827, and that the first fire in it was kindled by Thos. W. Means, Esq., now the senior partner of the firm of Means, Kyle & Co. That fire was kindled to some purpose for Mr. Means has lived to see nearly 50 furnaces in the Hanging Rock Iron District."